Hello, been a few days. It’s been rough going here in the land of project easier, which I know is an oxymoron, or something of that ilk. Sometimes the world seems a scary place, and the world of work a place ridden with either corruption or incompetence–don’t know which. Oh, god, that doesn’t sound easy at all. No. It’ hasn’t been. But there have been some silver linings and I know that in a few weeks or months I can look back and realize what I’ve learned from these days of struggle. But I am ready for summer. Here in the SF Bay Area, we are having a heat wave, causing us to rummage to the back of our closets for sundresses, skirts, and shorts. I am so happy that summer is coming. Every year for the last couple of years, my girlfriend and compatriot teacher (fabgirl) has taken me to visit her parents in Nevada and we have gone to Lake Tahoe to float in the cold, cold water on enormous rafts. With the dome of the blue sky above you, and the water lapping below you, nothing could be more serene. 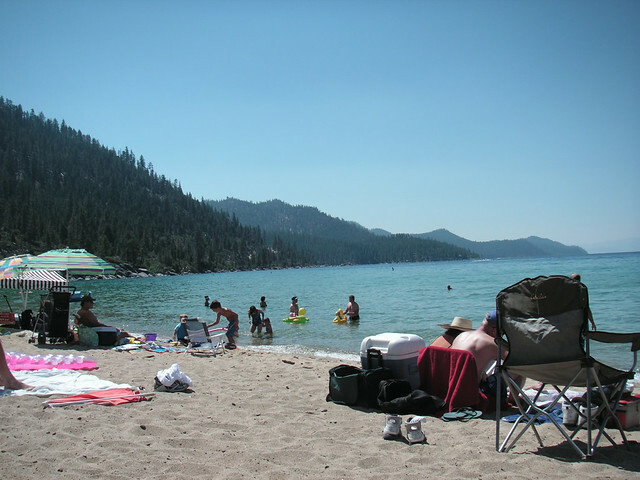 I am so excited to see Lake Tahoe again this summer. So glad, fabgirl has a boyfriend now, but hopefully he’ll have to work, or we all three can go. There’s nothing like floating, mindless, under the arch of that huge sky. The trees, the scent of pine, the sand. It’s heaven. Until you flip off your raft and it’s freezing. But that’s okay too. Wakes a person up–and you know I’m in favor of waking up. In favor or relaxing between wake-ups too. May those of you in snow enjoy the beauty of it and not be discouraged by it. These are just thoughts of a wimpy Californian waiting impatiently for summer. If you need a relaxing image, travel with me to the hot air and cold water, blue sky, and lapping water of being on a raft on Lake Tahoe. It’s all thanks to fabgirl. This entry was posted in Uncategorized and tagged beauty, care of the self, relaxation by Project Easier. Bookmark the permalink.